I thought, “oh, that’s cute,” so I performed a few more compound searches, and realized this is a standard feature from Whitaker’s. This isn’t too useful while reading Catullus, but if I were reading Virgil, or whichever Latin writers compete with Aeschylus for the title of ‘Master of the Ἅπαξ Λεγόμενον,’ it may prove very useful. Here’s the link to download. 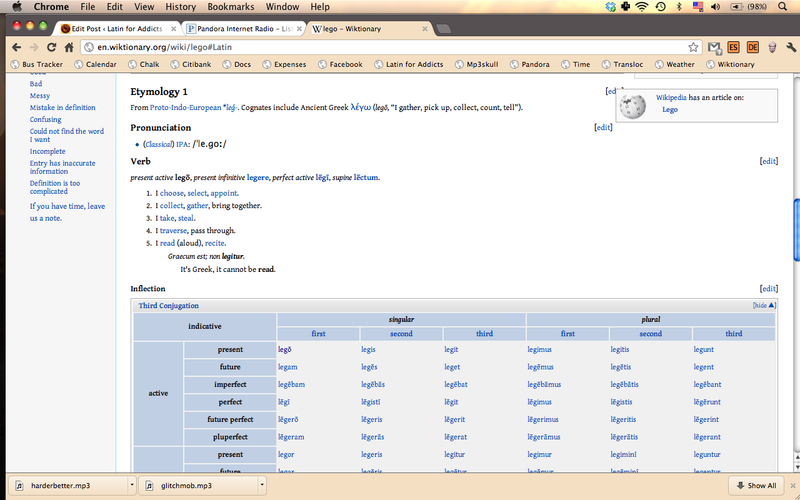 I’m still a die-hard for the Wiktionary, but I’m no longer monogamous. I may have been too harsh on Whitaker, in an earlier post, where I defined his dictionary as inferior alternative to Wiktionary. I still believe Wiktionary is the top Latin dictionary online, but here are a few redeeming qualities that Whitaker revealed upon closer inspections. 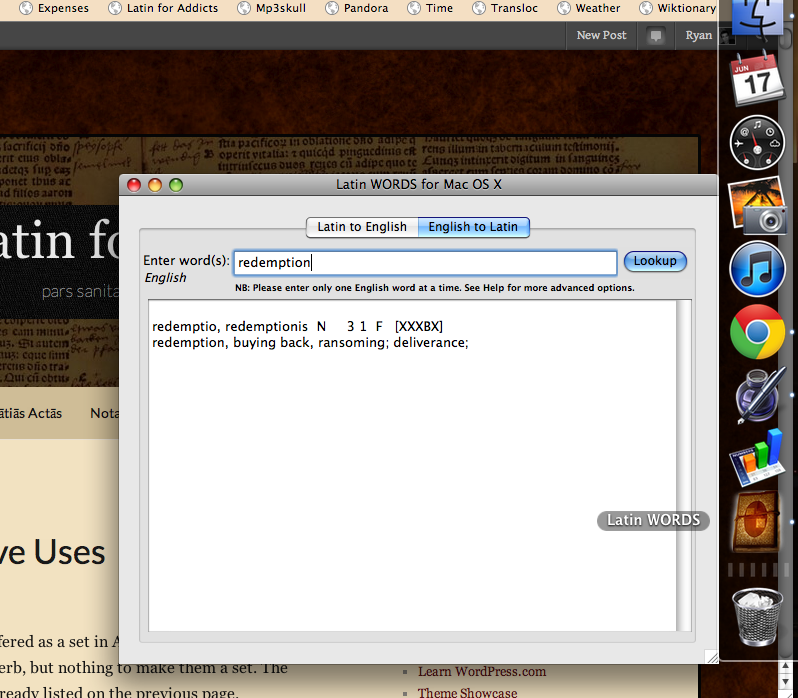 Which allows you to switch between Latin to English and English to Latin with a single click, and operates in one window with a search bar on the entry page so you don’t have to keep flipping back and forth. 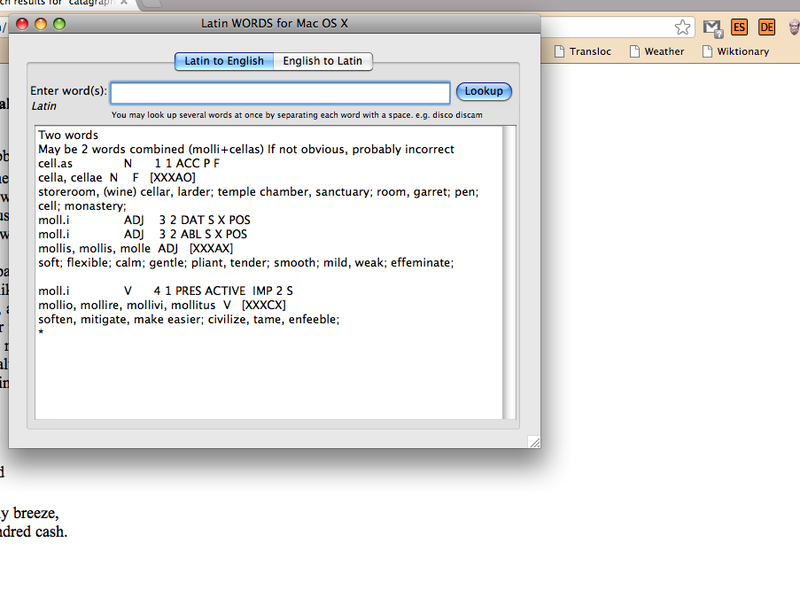 There’s also the extra-web application, Latin WORDS (available for all platforms), which has the same features. I’m not a fan of the extra window, but this interface is incredibly straightforward, and supposedly “more powerful” than the online resource. I’m doubtful, since the website would receive constant updates, but for my purposes it’s fine. Whitaker’s still lacks (a) etymologies, (b) related terms, (c) conjugations and declensions, and (d) derived terms, but these features secure its position as a reliable English-to-Latin Thesaurus, and not ‘what we’re stuck with’ in the absence of something better. 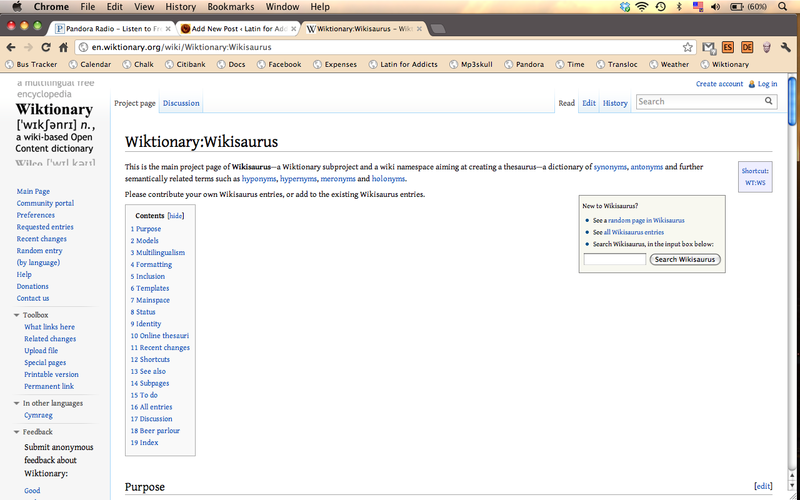 However, a Wikisaurus is in the works, and when it arrives (if it’s a multi-lingual thesaurus, which is still be debated)–bye-bye Whitaker’s. 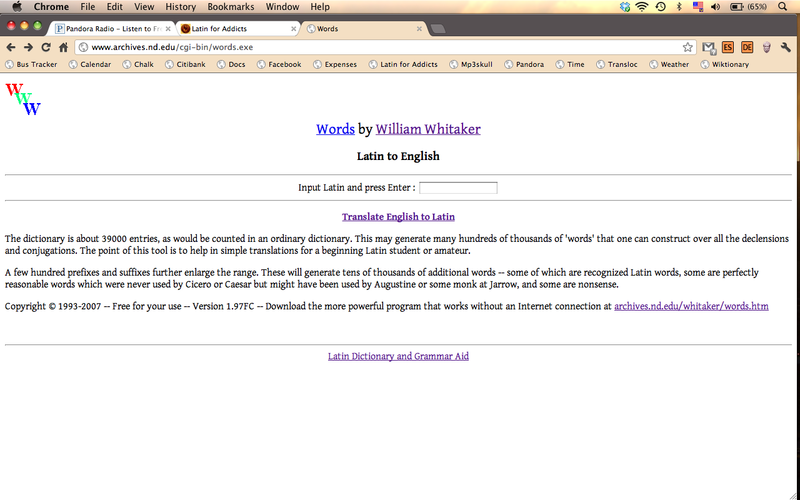 I’d like to offer the argument that Wiktionary is the top Latin dictionary available online. I’m sure I’ll meet with the same skeptics who consider Wikipedia an amalgam of amateurs. Let’s fight about it. Here’s my argument. 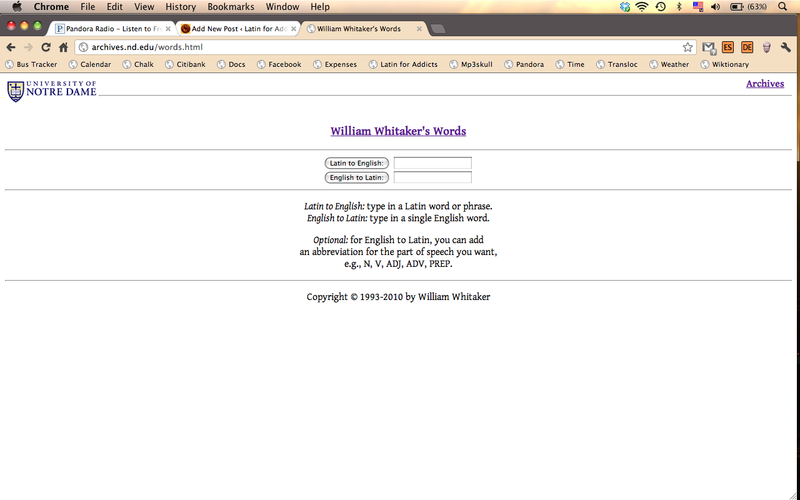 Wiktionary is superior to two specific alternatives: Whitaker’s Words and Lewis and Short (under Perseus). Wiktionary is easier to navigate than Perseus or Whitaker. Perseus is notoriously slow, and its entries aren’t incredibly readable. Whitaker is more straightforward, yet demands that I open two windows, which seems unnecessary. There’s no reason a search bar can’t also appear on the results page for further searches. Wiktionary beats these two because it’s fast and offers a friendly interface. Like Lewis and Short, it’s pretty good about idiomatic meanings, and it’s OK (just OK) with specifying special case usage and constructions. It’s also often great on etymologies–even pre-Latin etymologies. Admittedly, Lewis and Short are better at both of these features, which is why–I imagine–the link to their entry (under Perseus) is often included at the bottom of each Wiktionary entry. There’s really no need to start with Perseus if you don’t have to. Whitaker’s Words has a lot of mysterious notation explaining the way in which it parses words (none of which is explained on the site, so far as I can tell). As soon as the site completes its project on era/period frequency, it might be a much better site. Wiktionary also bests both of them by offering you conjugations and declensions (we’re talking full parses) without asking. They’re just right there on the page. Even better, it’s minimized to begin with, so if you’re a purist and you want to guess the form without the parse, or your just want to scroll down the page a little faster, you won’t encounter opposition. 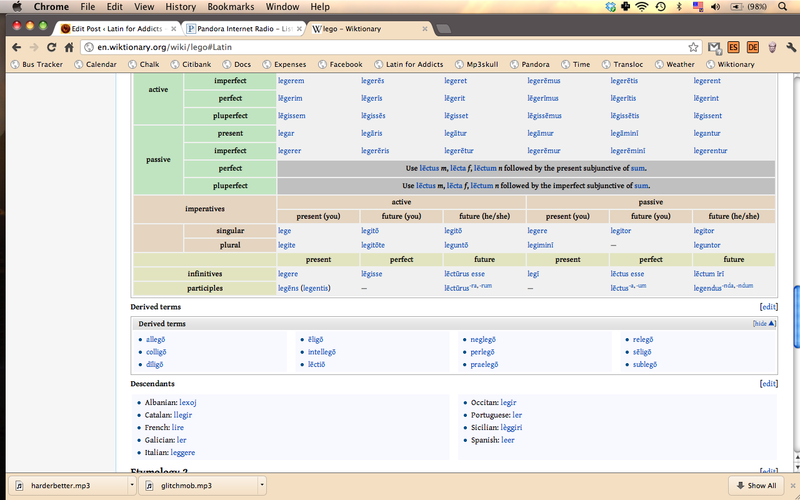 Wiktionary also shows derived compounds within Latin, and descendant words within other languages. It’s great! 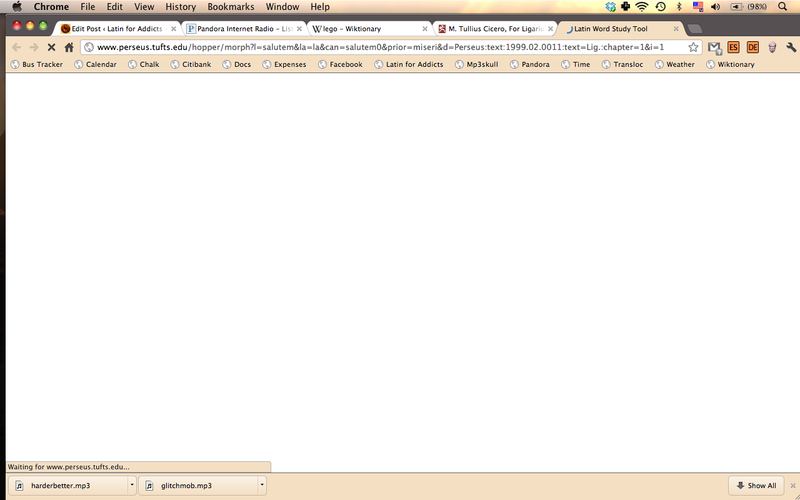 Of course, if I type ‘lego’ into the search bar, the page includes both legō (to read, etc.) and lēgō (to dispatch), with all the same perks. Exceptions for using Lewis and Short: (a) where Wiktionary fails to find an idiom or rare usage and (b) where I need to know era/period frequency. Exception for using Whitaker’s Words: where I have the English and I want the Latin. 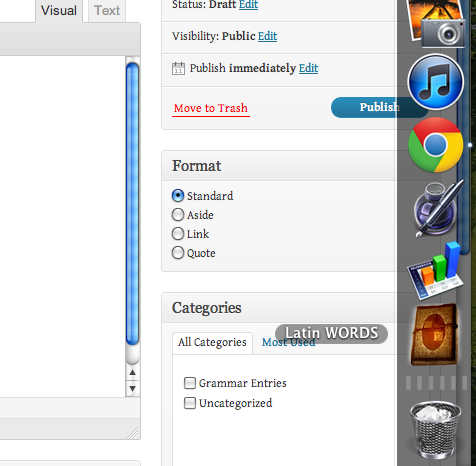 I haven’t found a better English-to-Latin Thesaurus just yet. Perseus performs this function (in a round about way, and at a snail’s pace). Any recommendations?